A key ingredient of any welfare program is work. Without work requirements in place for nondisabled, nonelderly enrollees, any welfare program naturally operates as a welfare trap. Staying in such welfare programs, languishing in dependence, enrollees miss an incalculable amount of opportunity to improve their lives. This is the cruelty of welfare, and it is why conservatives care so deeply about rescuing as many individuals from it as possible. It is also why work requirements, combined with time limits, are so important. Individuals cannot escape poverty without work; they cannot live the American Dream without work. Trapping individuals in a welfare program that discourages work robs them of the chance for a better life. As part of the great welfare reform of the 1990s, Congress transformed what was then one of the nation’s largest welfare programs. That effort, embodied in the Personal Responsibility and Work Opportunity Reconciliation Act of 1996, aimed to refocus the decades-old Aid to Families with Dependent Children (AFDC) cash assistance program. Under its new name, the Temporary Assistance for Needy Families (TANF) program was given new goals: Keep families together, reduce out-of-wedlock pregnancies, encourage the formation of two-parent families, and reduce dependence. One of the primary ways TANF seeks to accomplish all of these goals is by promoting work: transforming welfare from a way of life into a temporary safety net or trampoline back into independence. Congress gave states quite a bit of leeway when it comes to defining what counts as work under TANF. As a result, work requirements standards—and even those who are considered to be “work eligible”—vary greatly by state. In general, however, single-parent families with a child under the age of six are required to work, search for work, or participate in work training for 20 hours per week within two years of joining TANF. Other families with work-eligible adults must participate in these work-related activities for 30 hours per week. TANF also instituted lifetime limits (five years) for beneficiaries. These limits, combined with work requirements, have helped to accomplish TANF’s stated goal that welfare does not become a way of life but instead serves as a temporary safety net. The results were remarkable. In 1995, just a year before welfare reform was passed, more than 13.4 million individuals were dependent on cash assistance through AFDC. After the program was transformed and reoriented toward reducing dependence, enrollment began to plummet. In 2016, as the country celebrated the 20th anniversary of the historic welfare overhaul, enrollment sat at just 3.9 million individuals, roughly 727,000 fewer than had been enrolled just 10 years earlier. 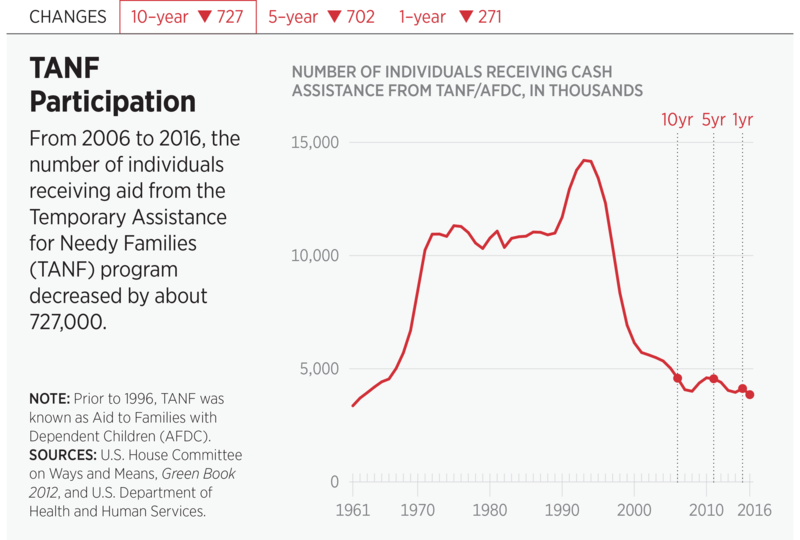 This represents a staggering 71 percent drop in TANF dependence since the year before welfare reform, reaching levels unseen since 1962. Unlike pre-reform recipients, individuals who enroll in the TANF program today know that their time is limited. They know, in most cases, that they are expected to work and that dependence on cash assistance is not a lifestyle they can maintain over the long term. This is good news for their well-being, because research has shown that the less time individuals spend on welfare, the quicker they will go back to work.1 And when they do, their incomes will more than double on average, more than offsetting lost welfare benefits and leaving them better off than they were before. As enrollment in other welfare programs like food stamps and Medicaid—programs in which work requirements and time limits are largely absent—continues to soar, the decline in TANF enrollment should serve as a blueprint for policymakers who are serious about reducing dependence. Nic Horton is a Senior Research Fellow at the Foundation for Government Accountability. 1. See, for example, Jonathan Ingram and Nic Horton, “The Power of Work: How Kansas’ Welfare Reform Is Lifting Americans Out of Poverty,” Foundation for Government Accountability, February 16, 2016, https://thefga.org/wp-content/uploads/2016/02/PowerOfWork-KansasWelfareReform.pdf (accessed April 29, 2017).